Syfy has announced that it’s picking up a new show about a demon-battling cowgirl who slugs down whiskey while kicking redneck zombie asses with boot-clad feet, because not everything can be a high-minded adaptation of a certified literary classic. The new series, Wynonna Earp, is being adapted from IDW Publishing’s comic book of the same name by Lost Girl’s Emily Andras, and follows the descendant of Wyatt Earp as she fights supernatural threats for a government agency. 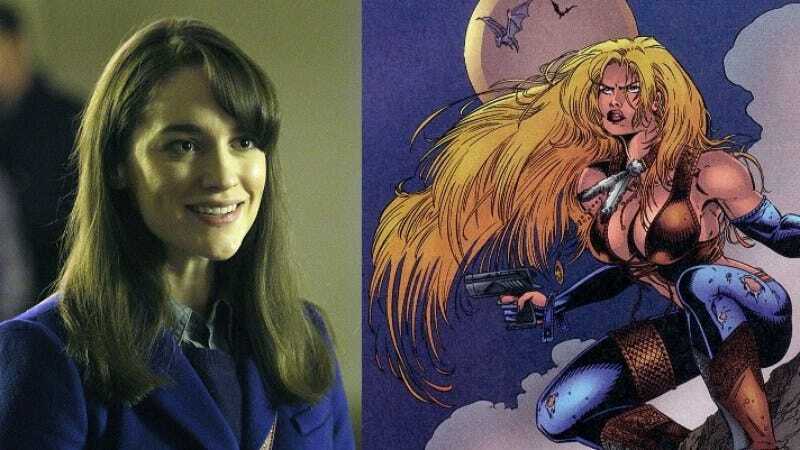 The series will star Melanie Scrofano, who’s really nailing down the “schlocky-looking cable horror series” market between this and her role on A&E’s Omen riff, Damien. She’ll be joined by Shamier Anderson and Syfy-original-series veteran Tim Rozon, who plays “legendary con artist Doc Holliday,” who you might know from The Legend Of The Person Who Really Existed, But Now They’re A Vampire Or Something On A Low-Budget Syfy Show. The series has been described as a cross between Justified and Buffy The Vampire Slayer, although a Google Image Search for the character suggests a little less of Joss Whedon’s feminist sensitivities, or Graham Yost’s slow-burn Western tension, and a bit more of pin-up models or old-school Baywatch. All that being said, the Wikipedia page for the series mentions that one of Wynonna’s enemies is “the Egyptian Mafia’s mummy hitman, Raduk, Eater Of The Dead,” a phrase that’s so provocatively metal that it might be worth justifying the show’s existence all on its own, at least until it goes the way of The Dresden Files or Painkiller Jane after a season or two. Wynonna Earp is expected to debut in April of 2016.